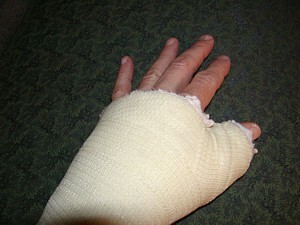 So, after the operation to rebuild my torn thumb ligament, I wasn't on two wheels for a week. Letting things heal up some, generally taking a break from the bike - not by choice. I did do some wrenching on the beater bike (as seen in Dirt Rag issue #110), now dubbed the Blue Falcon (more on that at another time). Installed a chainring since I stole one from it for the canal ride. Then, put on the Nitto Falcon/Albatross/Cruiser bars that Ricky D had picked up for me as a possible substitute on the above mentioned canal ride. Also installed a front brake since the bike was missing one and replaced the rear cable and housing. Doing all of this work with one hand immobilized was challenging to say the least, especially mucking with the canti brake set up and trying to install the extra tight grips before the Super 77 glue set up. The new handlebars work really good for with the injured hand and look stylish to boot, especially combined with the Paul's Basket. The bike has seen immediate extra duty as last week I've been temporarily working in Washington DC. She makes a fine cruiser to get me to the train. On Saturday, I finally put in some real saddle time - real as in more than just commuting type riding. What I'd found prior to this was this massive mound of fiberglass that is encasing my thumb, hand and covering my palm, does not allow for good handlebar grippage. Much less than the splint/brace that I had prior to the surgery. Climbing hills is tough, since I'm almost doing it one handed. So, I head out to a nearby rail-trail with the fixed gear that's relatively flat and put in an hour to see how things are. What I find is: I can ride, put it's not exactly easy. Luckily I've got the moustache bars for multiple hand positions and I need them. The important thing though is I can ride. Maybe not dirt right now and maybe not all of the rides I want to do, but it could be worse. Back to the doc in a bit over two weeks, we'll see what he says then. Finally, on a completely different note: Big thanks to everyone who showed up for Sunday's trail maintenance at Avalon. Twenty people total and we got a lot accomplished. One of the crew posted some pictures of one work section here.